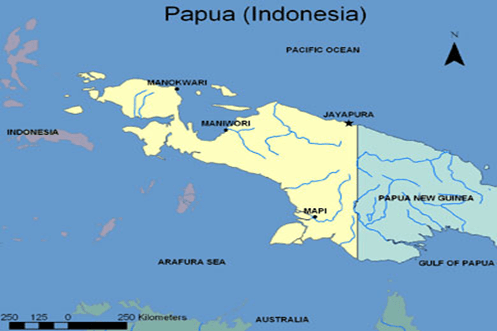 The region of Papua is formerly known as Irian Jaya and is half of an island shared with Papua New Guinea. Papua is one of the most remote parts of Indonesia, with many people who still live in the remote jungle without electricity or running water. The province is the farthest east in Indonesia, with the Maluku islands to the west. Papua became a part of Indonesia in 1969, when Indonesian security forces coerced a small number of tribal elders to vote to join Indonesia. Conflict began as a result, and has been off and on ever since. Papua has a central east-west mountain range that dominates the island. These are the highest mountains in Indonesia. Puncak Jaya is the highest mountain in Indonesia, standing 16,024 feet tall. This mountain, along with several others, is the only place in Indonesia where you can see snow! Throughout the rest of Papua are hundreds of miles of lowland rain forests, with extensive wetlands and mangrove forests. Like much of the rest of Indonesia, there is great diversity on Papua. There are over 270 languages. Although most are part of the huge Papuan language family, there are still many others who have no relation to any other language. 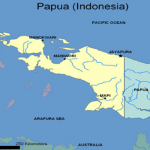 Almost two-thirds of Papuan languages are spoken by less than 1,000 people. A road system is being developed for the coastal and lowland areas, but the extreme rainfall makes it difficult to build and maintain roads. For most of Papua, air travel is the best way to get around. Most of the larger towns and cities have commercial flights that go in and out almost daily. Non-profit organizations and missions use their own planes to get to more remote areas. The pig is the most important item in the highland people’s economy. The wealth of a man is calculated by how many pigs he owns. They also grow sweet potatoes, taro, cassava, and various types of beans and corn. In the lowlands, sago palm is important, along with fishing on the rivers. The coastal people rely on the ocean for much of their income. Although many people consider Papua “reached”, there are still many people groups in Papua who have little to no access to the Bible and are basically animistic. The New Testament is only available in 30 of the 270 languages. Field researchers have determined there are fourteen areas of Papua with a population around 20,000, where there has been little to no evangelism. In some of these areas, it’s possible that there are tribes whose names aren’t even known by the outside world, as well as known groups which turn out to be more than one language group.